Operation Sirona, Tranche 2 Canadian Forces medical personnel from 2 Field Ambulance and 1 Canadian Field Hospital, Garrison Petawawa. Since December 2013, the Zaire Ebola Virus Disease epidemic has ravaged West Africa, in countries like Guinea, Liberia and Sierra Leone. A group of Canadian military health care workers were tasked in late November 2014 for Operation Sirona to augment the United Kingdom’s Operation GRITROCK at the Ebola Virus Disease Treatment Unit at Kerry Town, Sierra Leone. The unit is located 50 km south of Freetown and colocated with an 80-bed facility managed by Save the Children International. The unit consisted of a 4-bed “suspect ward” and a 16-bed “confirmed ward,” collectively know as the “red zone.” The treatment unit is mandated to provide a standard of care as close to that which the international health care workers volunteering there might expect in their home countries. It also serves as a beacon to give these volunteers the confidence to work in Sierra Leone knowing that they will receive world-class care if they acquire the Ebola virus. 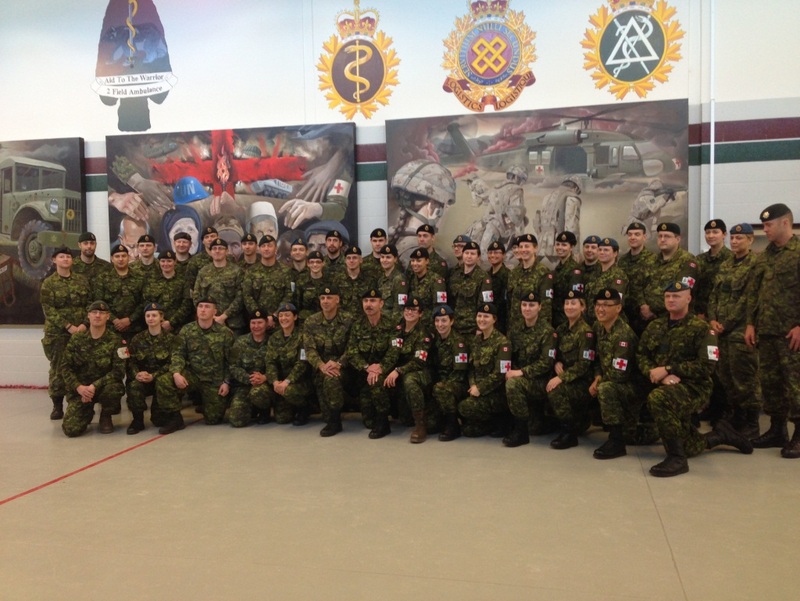 The current complement of 36 Canadian military health care workers is composed of 4 physicians, 14 general and critical care nurses and 15 senior medical technicians. All deployed military health care workers must attend Ebola Personal Protective Equipment (PPE) training at the Army Medical Services Training Centre in Strensall, Yorkshire, UK. The training centre was restructured from a military trauma hospital in Camp Bastion, Afghanistan, to simulate the treatment unit in Kerry Town. The 10-day training package culminated in a 3-day individual and collective training exercise. The PPE was selected based on expert advice and consensus agreement with civilian agencies in the UK, including Public Health England and the UK’s National Ambulance Resilience Unit. The drills on the donning and doffing of PPE were practised repeatedly until learners were familiar with the equipment and comfortable wearing it for a prolonged period. Emergency drills for health care workers who collapse while working in the treatment unit are widely practised. These drills involve self-recognizing physical and psychological limits and removing oneself from the facility when those limits are reached. The most important drill is to practise doffing PPE. The removal of the equipment is done under the direct supervision of a dedicated monitor to prevent inadvertent mistakes from losing concentration at the end of a challenging work period. For the training exercise and under the directing staff, the actor patients’ signs and symptoms developed accordingly. Participants needed to assess self-tolerability and functioning capability while wearing PPE when caring for patients with Ebola and performing medical procedures. The actors were provided realistic simulated body fluids such as diarrhea, urine and vomit. Procedures performed included peripheral intravenous insertion, central line insertion, venipuncture, Foley catheter insertion, bowel management system insertion and decontamination during patient care. Ultraviolet (UV) dye was added to body fluids and titrated in accordance with the viremia corresponding to the simulated severity of the patient’s disease. This tracer was used to test the robustness of clinical staff decontamination procedures after contact with patients through body mapping before and after the removal of PPE by passing a UV lamp over their body. It provides immediate feedback on repeatedly contaminated areas and thus helps to change and improve drills on an individual basis. his process provides confidence to the individual in both the equipment and the doffing procedures. This challenging working environment is further exacerbated by the ambient temperature and humidity in Sierra Leone. The daily average temperatures are in excess of 30°C, and humidity ranged from 45% to 95%, resulting in working temperatures closer to 40°C. The training centre would simulate temperatures close to the real environment, thus limiting trainees to 1–2 hours in PPE to prevent dehydration and heat exhaustion. This teaches the principle of planning clinical tasks around the coolest parts of the day and preparation of a “to do” list before entering the red zone. The facility is also equipped with closed circuit TVs so that each patient can be monitored in case of emergency. The training exercise solidified our two militaries as a single unit and prepared us for the working conditions at the treatment unit. It enabled us to provide the requisite care to patients at various stages of the disease while wearing PPE in high daily temperatures. Operation SIRONA continues to augment the UK’s Operation GRITROCK in Sierra Leone. Posted in Medical Dispatches. Tags: Ebola Virus Disease, Jeff Praught, military training, Operation GRITROCK, Operation Sirona, personal protective equipment, Raymond Kao on April 16, 2015 by CMAJ.